On October 27 , a gunman armed with an AR-15 assault weapon and three handguns opened fire in the Tree of Life synagogue in Pittsburgh, PA, killing 11 people and wounding six others, making this  the deadliest anti-Semitic attack in American history. The gunman frequently posted on the far-right social media network Gab , where he repeatedly  threatened the Jewish community and spread conservative conspiracy theories  about a migrant caravan of refugees headed for the U.S. Specifically, the gunman pushed  the conspiracy theory that Jews are behind the caravan. 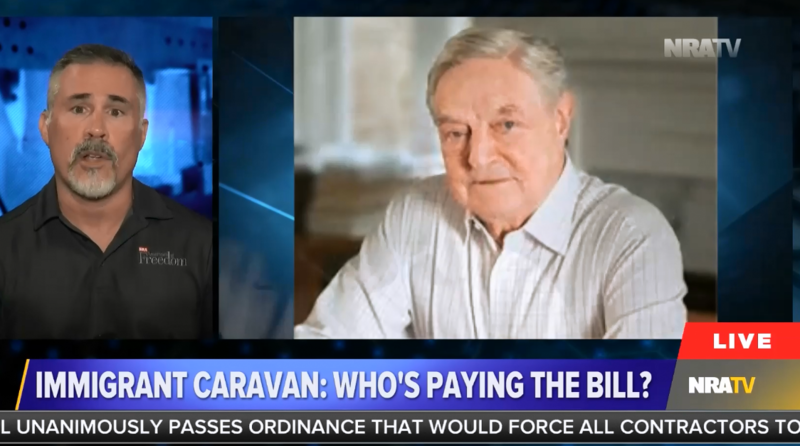 In actuality, NRATV hosts themselves have repeatedly  pushed conspiracy theories about the migrant caravan; NRATV correspondent Chuck Holton claimed  during an October 19 NRATV broadcast that “a bevy of left-wing groups are partnering with a Hungarian-born billionaire [George Soros] and the Venezuelan government to try to influence the 2018 midterms by sending Honduran migrants north” in a caravan. Soros is a prominent Jewish philanthropist who frequently makes donations to liberal and progressive causes. Both Holton  and Stinchfield  have referred to the caravan as an “invasion,” which is also how the gunman  characterized it.